Leaves of trees suffering from scorch die along the leaf margin. 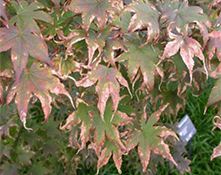 Leaf scorch can result in the browning or yellowing of leaves and affected leaves may drop prematurely. Dieback of twigs and then limbs may follow foliar symptoms. 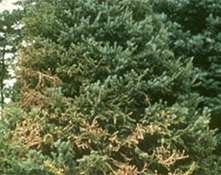 Severe water deficit in coniferous trees during summer causes needles to lose turgor and bend or droop at a point near the needle base. Needles then either fade and turn brown or remain green and permanently bent. Newly planted trees and those in areas where soil volume is limited (such as parking lots or along sidewalks) or where there is intense heat reflection are most susceptible to scorch. Water is the most limiting factor for plant growth. The most critical period for drought stress is after transplanting. Water deficits develop normally in plants when loss by transpiration exceeds absorption from soil, as it does almost daily during the growing season. Water is replenished at night and during periods of rain or dew formation, when transpiration slows or ceases. As soil dries, roots fail to extract as much water as has been lost and physiological stress develops. Well-established trees rarely die from drought injury. 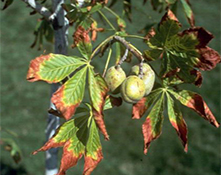 Water deficits also develop in dormant plants, both evergreen and deciduous, during winter as water evaporates from leaves and stems. Plants vary in their ability to tolerate low water potential. Salt injury or toxicity can cause similar symptoms. Keep trees adequately watered during periods of drought. Mulch will help retain soil moisture. Irrigation bags may be useful for providing water in areas where irrigation is limited. Refer to Four Seasons Tree Care “Watering Guidelines” and “Salt Injury” fact sheets.